A call to Kevin Bonnie at International Yacht Collection brings news of a substantial $5.9 million price drop on the 57.9m motor yacht Mi Sueño, a joint listing with his colleague Mark Elliott. Delivered by Trinity in 2010, Mi Sueño features seven spacious staterooms, including one equipped for a wheelchair, a Patrick Knowles interior design, touch-and-go helicopter capability, tender garage and passenger elevator. ABS classed and MCA compliant, she was designed for a transatlantic range as well as a draft suitable for cruising the Bahamas and US East Coast. 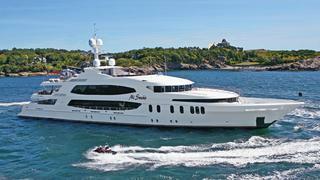 With a maximum speed of 20 knots and a range of 4,000 nautical miles at 10 knots, Mi Sueño is now asking $48.9 million.